Specifications: Battery Power: 20000mAh Item Width: 7.5 cm Battery Average Life: More than 1500 times Battery Charge Time: 5-7hours Output Power: 5V -12V-19V & 0.5A -2A-3.5A About Item Height: 4.0 cm Voltage: 12V Battery Specific: Lipo Battery Item Length: 16.5 cm tem Type: Battery Charging Units Item Weight:605g LED Light Function: Built-In white,red and blue led three light Starting current:200A Peak current:400A Condition: brand new Mini Size:13.2x7.5x2.5 cm Color:Multi color Features: 100% Brand New and high quality! 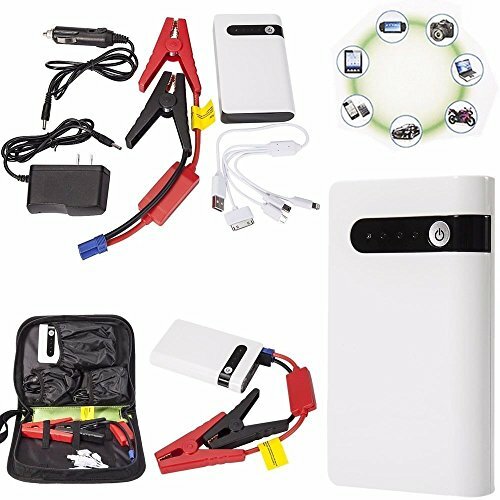 You can use car charger or AC charger to charge this jump starter. It can start Gasoline car below 3.0L, but not suit diesel car. Starting a vehicle approximately 10-20 times After fully charged. High Quality LED Torch, can lighting about 40 hours. Very convenient .can be charge at home and car. Short circuit, over-charge, and over-heat protecting,very safe.